NASA’s Jupiter-orbiting Juno spacecraft may have just boosted the already-impressive volcano tally on the gas giant’s lava-spewing moon Io. 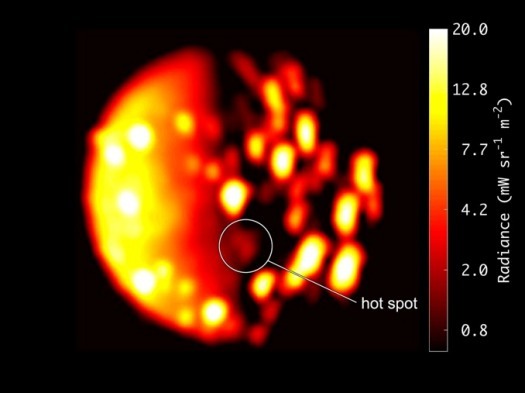 Juno’s Jovian InfraRed Auroral Mapper instrument, or JIRAM, detected a sizable “hotspot” near Io’s south pole on Dec. 16, 2017, during one of the probe’s close Jupiter flybys. Juno was about 290,000 miles (470,000 kilometers) away from Io at the time, NASA officials said. “We are not ruling out movement or modification of a previously discovered hotspot, but it is difficult to imagine one could travel such a distance and still be considered the same feature,” Mura added. Io is the most volcanically active body in the solar system, with its insides roiled and churned by Jupiter’s powerful gravity and the tugs of its fellow Galilean satellites, Callisto, Ganymede and Europa. Thanks to the efforts of ground-based telescopes and NASA probes such as the Jupiter-orbiting Galileo and the Saturn-studying Cassini, astronomers have already mapped about 150 volcanoes on the moon, some of which blast lava 250 miles (400 km) out into space. The $1.1 billion Juno mission arrived in orbit around Jupiter on July 4, 2016. The spacecraft loops around the gas giant on a highly elliptical path, making close flybys like the Dec. 16 encounter every 53 days. During these passes, Juno studies Jupiter’s composition, structure, and gravitational and magnetic fields, looking for clues about the huge planet’s formation and evolution (and also collecting a wealth of other data, as the Io observations show).